A new soy-based adhesive created in Jonathan Wilker’s lab at Purdue University could solve such problems pertaining to having cake pieces stick together in large designs. Wilker studies how marine animals, such as oysters and mussels, create natural adhesives. Unlike most glues you would find in a hardware store, these adhesives are non-toxic, and many hold up underwater. While trying to re-create a new glue in his lab one day, Wilker noticed something strange. “Things were sticking when they shouldn’t have been,” said Wilker. This is the essence of Maillard chemistry, or “cooking chemistry”. It happens when you grill a streak or bake bread in the oven; after a while, the edges start to brown and a savory smell fills the air. Chemically, sugars and proteins are combining to create aromatic compounds. Usually, it takes heat to kick off this process, but Maillard chemistry is a whole class of messy reactions, and it can happen a few different ways. Products of each reaction get involved in their own reactions and can release chemicals that we experience as flavors. “When foods brown, certain molecules are linking together. Proteins can connect to one another by reacting with sugars,” Wilker said. This new soy-based adhesive does not hold up well under water, so it may not be a perfect replacement for the toxic glues used in plywood and chipboard (the fumes from which, when used to build houses, can be breathed in by homeowners for many years). However, it may find use in packaging of organic-certified food products. Not only is this new adhesive made from food components, but it’s even stronger than Gorilla Glue on wood. On aluminum, it is about the same. 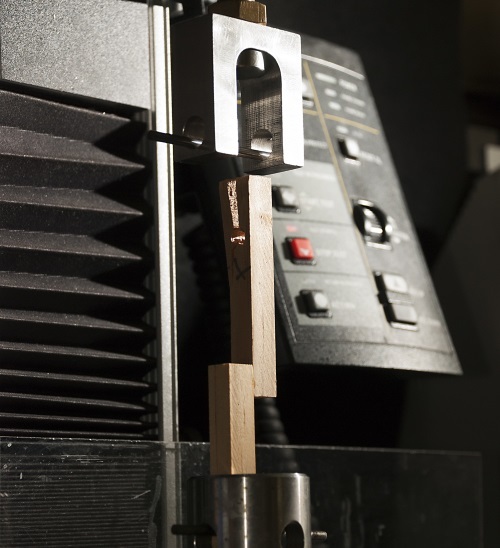 To test the strength of the adhesive, Wilker’s team glued two pieces of wood or aluminum together. The far ends have a hole for a pin, and a machine pulls them in opposite directions to test their strength. The new adhesive was so strong on wood that the pin ripped through the hole. Although the soy-based adhesive was pretty strong, the team achieved even better results with a different protein, bovine serum albumin (BSA). BSA is a generic protein often used in labs for experiments. It is cheap for researchers, but not cheap enough to make a BSA-based adhesive affordable on a large commercial scale. “If you want to break into the adhesive market, your product needs to be cheap, high-performance, and the material also has to be available on large scales,” Wilker said. Story by Kayla Zacharias, Purdue University.